Successfully Added Meizu MX4 4G Smartphone - 16GB Capacity, International Version (Gray) to your Shopping Cart. Think high with the new Meizu MX4 phone that is now available from Chinavasion, who are the one and only China based company to have international distribution rights. Powering this Goliath of a phone is the powerful MTK MT6595 octa core processor. 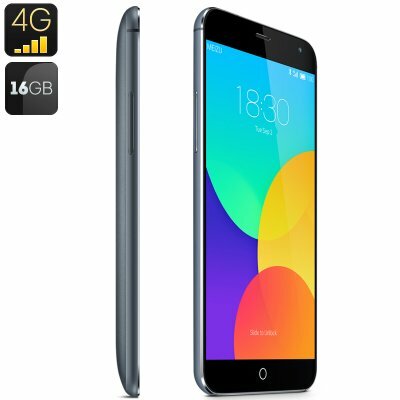 The Meizu MX4 smart phone is one of the first phones using this chipset and its rumored to score of over 50,000 points on Antutu. This chipset has four 2.2GHz A17 cores along with four 1.7GHz A7 cores that can when turned on simultaneously provide a lightening quick response and offer very efficient operational use. What’s more there is an additional IMG Rogue G6200 600MHz chip as well as a PowerVR G6200 MP4/600MHz GPU all within the slim shell of the Meizu MX4 smartphone. The Meizu company are eager to take advantage of the new 4G network and it shows as the newly released MX4 phone is able to support 4G TD - LTE (1900/2300/2600MHz) and FDD - LTE (1800/2100/2600MHz) bandwidths. You can still use this phone with 3G TD - SCDMA(1880-1920/2010-2025MHz) and WCDMA/HSPA +(850/900/1900/2100MHz) networks. As well as enjoying basic 2G GSM/GPRS/EDGE (850/900/1800/1900MHz) networks. Flyme 3.0 is Meizu’s heavily forked version of Android and has been highly lauded for its simplicity and unique design. Meizu has built on this with their new Flyme 4.0 operating system which is based on the ever popular ‘KitKat’ Android 4.4 operating system. This is proving to be the leading mobile phone software available today which boasts tones of features and abilities, alongside its cool user-friendly interface. Meizu have really worked hard and pulled out the stops with the rear camera on the MX4. This camera incorporates a Sony premium IMX220 Exmor RS sensor, has a blue glass IR filter and boasts a massive 20 megapixels so you can capture some stunning shots. If that wasn’t enough you can use the digital zoom and 260 degree panoramic features as well as the burst mode functions, which can take upto 100 photos at 25 pictures per second. With 5 lenses, F/2.2 aperture, a 78 degree wide angle, 4K resolutions at 29 FPS, 1080p at 30 FPS and 720p at 100FPS, you will be able to capture all the special moments in your life with vivid detail. When you are on the go you can experience the real - time display panorama that the rear camera provides as well as HDR in addition to face and gesture detection. Once the sun goes down the nightlight stabilization with ISP built -in multi-frame noise reduction stabilization will ensure you can still capture great shots.